Many of these decks are new spins on already-existing archetypes, but they still feel fresh and rewarding to play with. Unless you’ve been living under a rock this month, you know Blizzard ushered in the holiday season with a new wave of Hearthstone balance changes. If you’re a Druid or Odd Paladin player, then the changes probably didn’t brighten your holiday very much. That being said, the changes have opened up the playing field to an entirely new wave of decks that are having success on ladder. 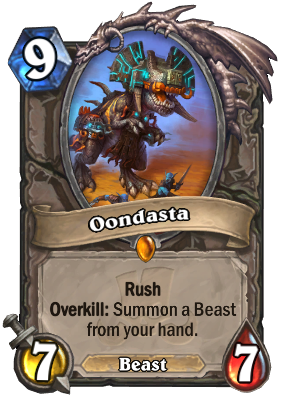 This deck is a classic take on Odd Warrior that throws in a curveball with the addition of the new nine-cost Beast card, Oondasta. The card has seven health and defense respectively, and also has Rush and an Overkill effect that lets you summon a Beast from your hand. Since Oondasta has Rush, it can attack minions on the same turn in which it’s summoned. Successfully kill a minion the turn you drop Oondasta and now you get to play two potentially high-cost Beasts for the price of one. The deck is filled with high-cost Beast cards like Amani War Bear, a seven-cost 5/7 with Rush and Taunt. Pulling out something like the War Bear with your Oondasta allows you to manipulate the late game board, while also setting up for a potential big Beast-driven win condition. The deck also includes the Warrior quest Fire Plume’s Heart, which awards you with Sulfuras if you’ve played seven Taunt minions previously in the match. Sulfuras is a three-cost weapon with four attack and two durability, but its Battlecry causes your hero power to deal eight damage to a random enemy. The idea with this deck is to control the board with your Taunt minions while also throwing damage into your opponent’s face when you have the chance. If your Oondasta turn doesn’t finish your opponent off, the hero power given to you by Sulfuras surely will. Mind Blast Priest is a deck archetype that has been around for a while and existed in many different forms. Prior to the balance changes, many versions of Mind Blast Priest weren’t seeing much success due to how badly it struggled against Paladin and Druid. Now that these two classes are nowhere near as prevalent on the ladder, there seems to be a Mind Blast Priest list that has finally found a place in the meta. 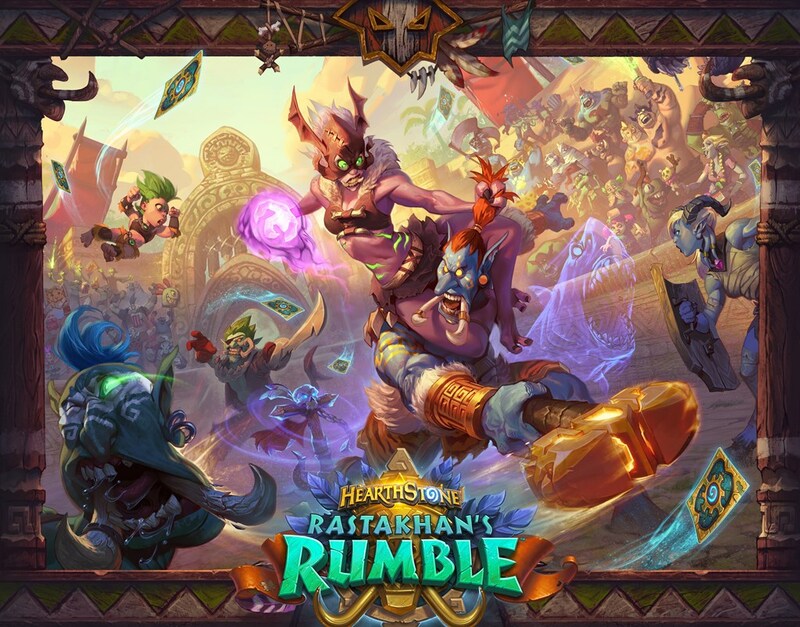 Priest is a class that always receives a lot of help in the form of Dragon cards and it got a few new Dragon-related toys in Rastakhan’s Rumble. 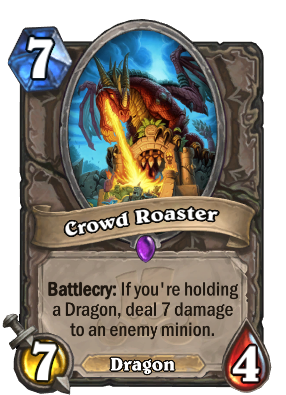 Crowd Roaster is a seven-cost 7/4 Dragon with a Battlecry that lets you deal seven damage to an enemy minion if you’re holding a Dragon. This is amazing value for the mana cost and can provide a tipping point when it’s available for play. Another low-cost Dragon-related buff to the deck comes in the form of Firetree Witchdoctor. This card is a two-cost 2/2 and while it isn’t a Dragon type itself, it allows you to discover a spell as long as you’re holding a Dragon. Outside of these new additions, the deck plays pretty similar to how it has in the past. You’ll spend a lot of the early game holding off your opponent and trying to control the board with cards like Duskbreaker and Psychic Scream. You’ll eventually want to play Shadowreaper Anduin, followed by Alexstrasza. This allows you to set your opponent’s health to 15, before destroying them with Mind Blast and your newly-enhanced hero power. The first week of the expansion many players were attempting to make an Odd Rogue list work. Unfortunately, due to how poor the deck archetype performed against Druid and Odd Paladin, it was never able to gain any traction. Much like Odd Warrior found new success after the nerf bat struck Druid and Pally, Odd Rogue finds itself in the same position. Now that Odd Paladin is no longer the king of aggro, many decks are clashing on ladder to claim that title. Odd Rogue brings a host of low-cost combos to the table that makes it a viable contender. You’ll be running low-cost spell cards, like Cold Blood and Myra’s Unstable Element, to help you get maximum value out of the aggressive minions in your deck. Cold Blood is a one-cost spell that gives a minion an added two attack, or four attack if played as a combo, meaning you played another card previously in the same turn. Myra’s Unstable Element is a five-cost spell that allows you to draw the rest of your deck. The deck is filled with cards like Vicious Fledgling and Southsea Deckhand, which are great additions to any aggro deck thanks to the early game pressure they provide. The cherry on top (and what you’ll usually use Myra’s for) is Leeroy Jenkins. Leeroy is a five-cost 6/2 minion with Charge and it summons two 1/1 whelps for your opponent. While the whelps could easily be used to kill Leeroy on your opponent’s next turn, that usually won’t matter. The idea here is that by the time you play Leeroy, you aren’t planning on your opponent having another turn. Both Odd Paladin and Odd Warrior are great budget options for longtime players. If you’ve been playing since the Frozen Throne expansion, you’ll probably already have a lot of the cards required to craft either deck. Regardless of what deck you decide to take to ladder, try to find one that fits your playstyle. If you prefer a more control-based playstyle, Odd Rogue probably isn’t for you, but you might love Mind Blast Priest. If you prefer a more aggressive style of play, the opposite is true.